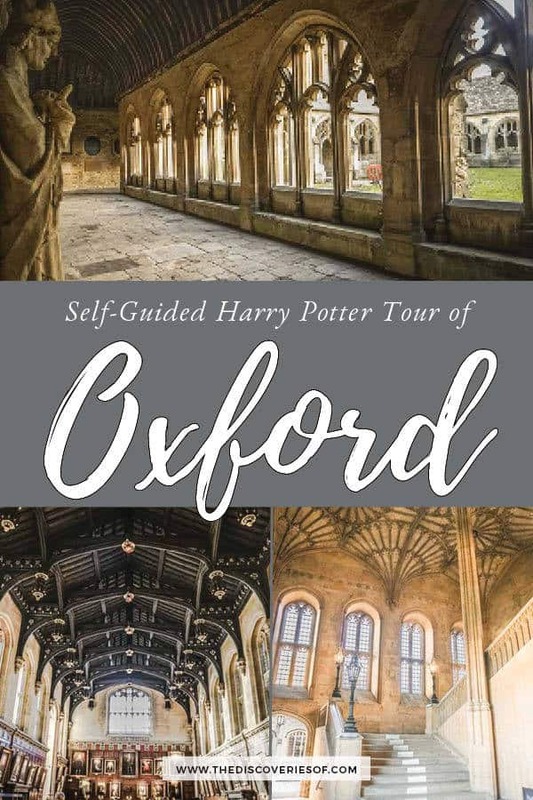 Self-Guided Oxford Harry Potter Tour - Filming Locations + Map! Oxford + Harry Potter = are you ready for an adventure? 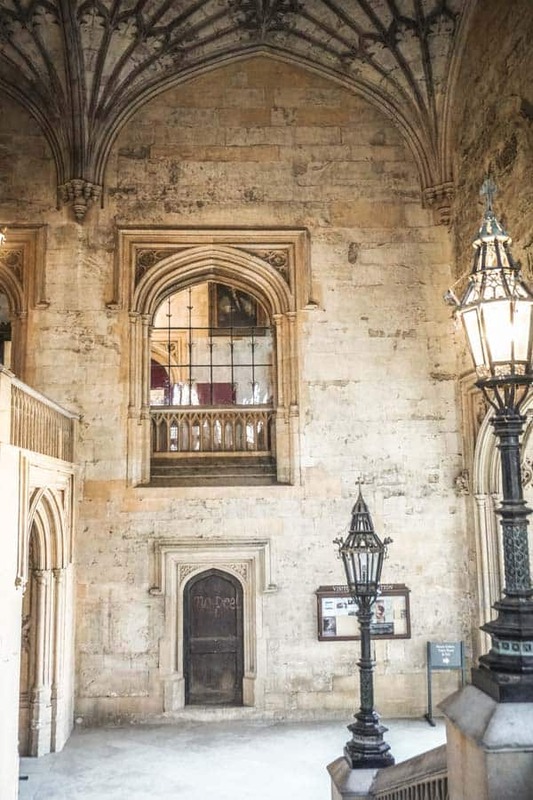 Get your wands out and bring your broomsticks – we’re going to explore this magical city on a self-guided Harry Potter tour of Oxford. If you asked me to name two of my very favourite things I can hand on heart say that Oxford and Harry Potter would be my picks. Why? I studied at Oxford University and it will always have a special place in my heart. Three years of scurrilous endeavours and hard work in what I still think is the UK’s most beautiful city. Add to that a long-lasting obsession with Harry Potter that started way back in 1997 when Harry Potter and the Philosopher’s Stone was first released and that still sees me sit down with J and watch all the Harry Potter films every Christmas and you will start to get the picture. I’m guessing that if you’re reading this, you’ll totally understand. So what are we waiting for? Let’s set off on our Oxford Harry Potter tour. First Up Was Harry Potter Filmed in Oxford? What are the Oxford Harry Potter Locations? Yes! Some parts of the Harry Potter films were shot in Oxford, along with other British destinations like London, nearby Blenheim and Alnwick. PS – If you want an in-depth guide to Oxford’s top sights, check out my guide to the best things to do in Oxford. At a quick glance, Harry Potter was filmed in the following Oxford locations. PS – I give you more than enough information to do your own self-guided Harry Potter tour of Oxford but I know that some people still like to have a guide to show them around. If that’s you, you can browse these highly recommended guided tours. Christ Church contains quite a few stops on the Harry Potter Oxford tour, so although you have to pay an entrance fee to get into the college, it covers more than one filming location. This historical college has a long and illustrious history that saw it founded as the pet project of Cardinal Wolsey, before being nabbed and renamed by Henry VIII (I guess that being king has a fair few advantages). It was later used as the Royal base during the English Civil War. All very interesting, but Christ Church also just so happens to be the Oxford College most connected with Harry Potter – so it makes sense to start our Harry Potter walking tour of Oxford here. The first Christ Church Harry Potter location is certainly the most famous – Christ Church Great Hall, which provided the inspiration for Hogwarts’ dining hall. 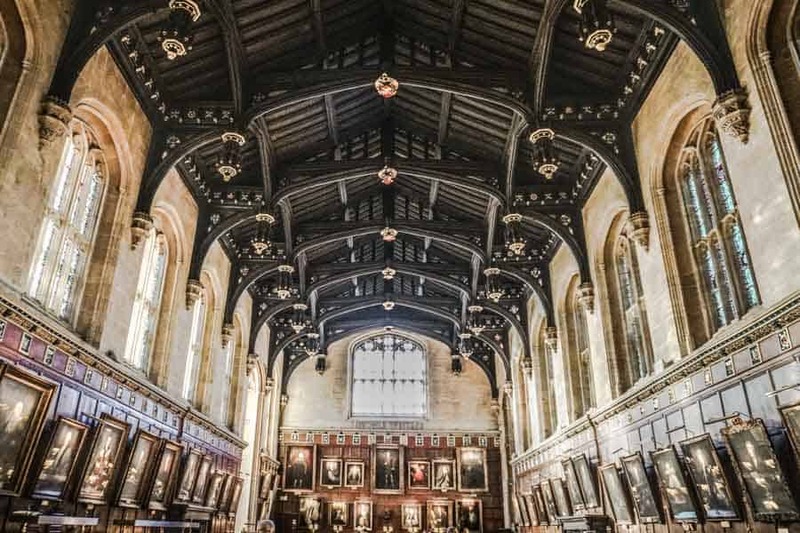 I should be clear – contrary to popular belief, you won’t find the actual Harry Potter dining hall in Oxford. Scenes filmed in the hall were actually done on set in the Warner Bros. studios but the set was created with close reference to photos and descriptions of Christ Church’s hall. Good enough right? Watch the Clip – First Glimpse of Hogwarts Hall in Harry Potter and the Philosopher’s Stone. PS – Did you know that Christ Church isn’t actually the biggest dining hall in Oxford. That title goes to my old college Keble. Rumours have always flown that the producers wanted access to Keble’s hall but were refused. Is it true? No idea – but I’ll be controversial and say that Keble’s hall is better* so I wouldn’t be surprised. *Runs and hides from the inevitable rain of fury from Christ Church’s many adoring fans. Whenever I hunt out filming locations, one thing I always love seeing is how films and TV programmes use the same spaces for different purposes. I saw it with the Game of Thrones filming locations in Dubrovnik and Christ Church’s Harry Potter filming locations are no different. The Bodley staircase, leading up to Christ Church hall is one such location. 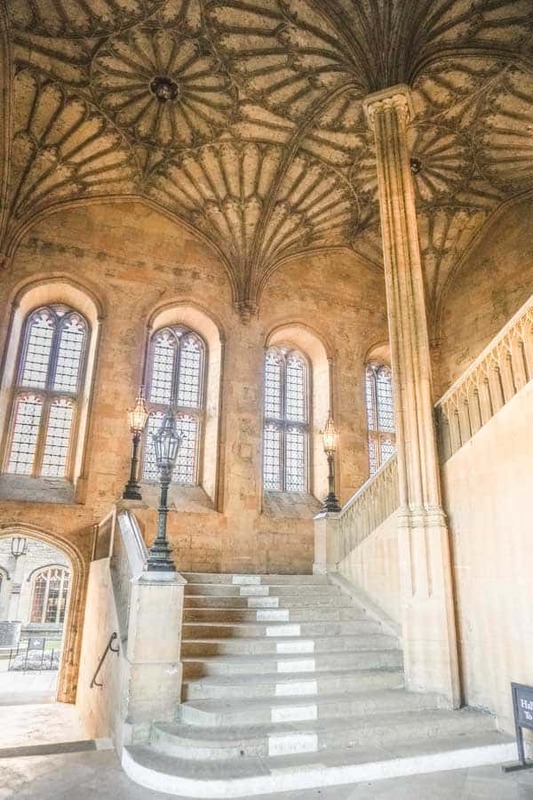 The top of the staircase is used in Harry Potter and the Philosopher’s Stone when the new first years (including our favourite trio Harry, Ron and Hermione) walk up to Hogwarts for the first time and are welcomed by Professor McGonagall. We also see them return to this spot at the end of the film after they’ve defeated Quirrell and Voldemort and are about to head home. The bottom of the stairs are used in Harry Potter and the Chamber of Secrets – both as the spot where Harry and Ron are collared by Argus Filch after their escapade with the flying car and also where Harry meets Tom Riddle. Visiting Christ Church? Make time to visit the Christ Church Picture Gallery, which is one of Oxford’s best museums. I told you there are a lot of Christ Church Oxford Harry Potter sites! This one is a little more tucked away than the others. Again, it’s one from The Philosopher’s Stone – the location where Hermione shows Harry that he was born to be a seeker – showing him all the trophies that James Potter won during his time in Hogwarts too. Watch the Clip – Harry becomes a seeker and Hermione shows him his father’s Quidditch trophies. Next up on our Harry Potter tour of Oxford? The Bodleian Library’s gorgeous Divinity School. 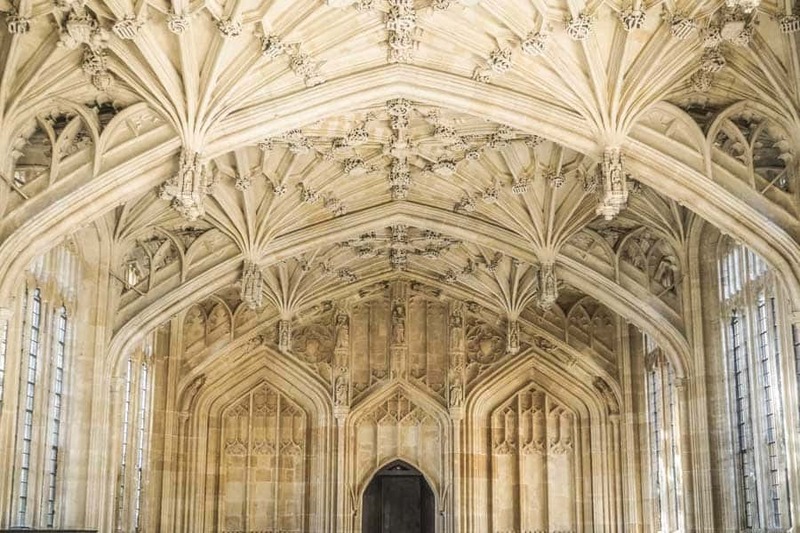 The Divinity School is another spot where Oxford University and Harry Potter meet. It was used as a filming location in Harry Potter and the Philosopher’s Stone and in subsequent films as the Hogwarts Infirmary. Remember that scene in the Philosopher’s Stone when Harry is recovering after his first encounter with Voldemort and Dumbledore comes to visit him. Or when Harry and Hermione use the time turner leaving poor Ron in the hospital bed in Harry Potter and the Prisoner of Azkaban. No doubt you recognise it, the combination of the beautiful lierne vaulted ceiling and those windows isn’t easily mistaken. The Divinity School not only features as Hogwarts hospital, it makes an appearance in Harry Potter and the Goblet of Fire as the hall in which the students practice their Triwizard Tournament dances. Who knew that all that awkwardness (Ron’s face when he has to hold McGonagall’s waist is just classic) took place in such a beautiful location? Watch the scene – Harry has a chat with Dumbledore while recovering in the infirmary. Duke Humfrey’s Library also makes an appearance in Harry Potter and the Philosopher’s Stone. Angel Sharp Media, (c) Bodleian Libraries, University of Oxford. You know the scene where Harry is wearing the invisibility cloak and looking for information in the restricted section of Hogwarts Library? Yep, you guessed it – that’s the Duke Humphrey’s Library. Watch the scene – Harry hunts around in the restricted section of Hogwarts library. 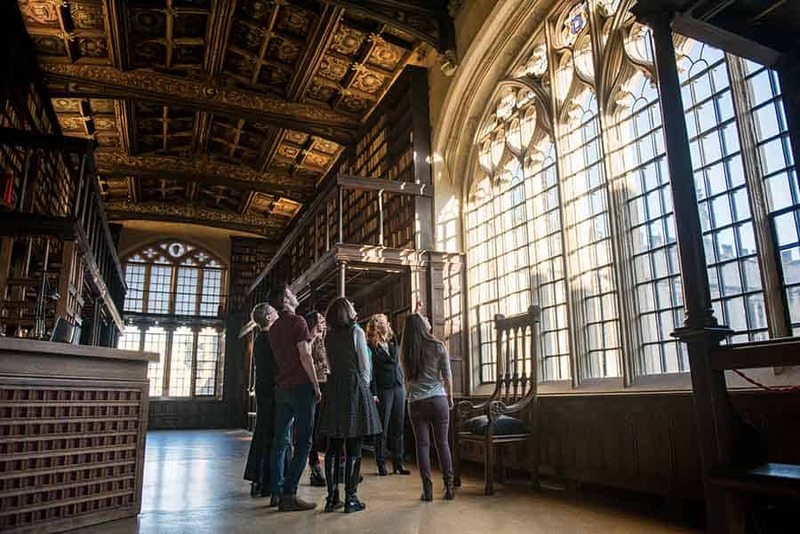 Fee for entering Duke Humfrey’s Library: Can only be accessed on a tour. Cost £6. It’s a short walk from the Bodleian Library to New College. 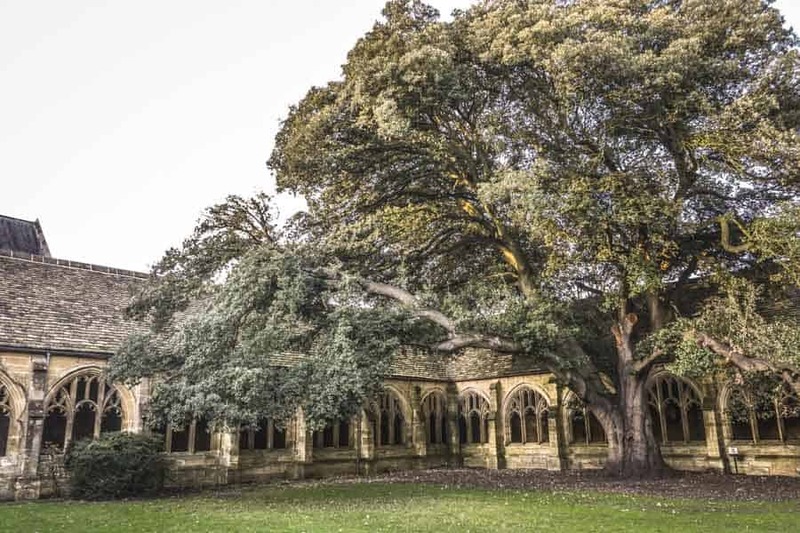 Although I knew about quite a few of the Harry Potter filming locations in Oxford before my last trip, the New College cloisters were completely new to me. New College itself could easily double up as Hogwarts with its arched stone tunnels and imposing architecture. Don’t let the name fool you – the “New” College actually dates back to the 14th century (ha! Only in Oxford). What a discovery – the gloomily quiet cloisters are one of my new secret spots in Oxford. That’s great – but where do they pop up in Harry Potter? 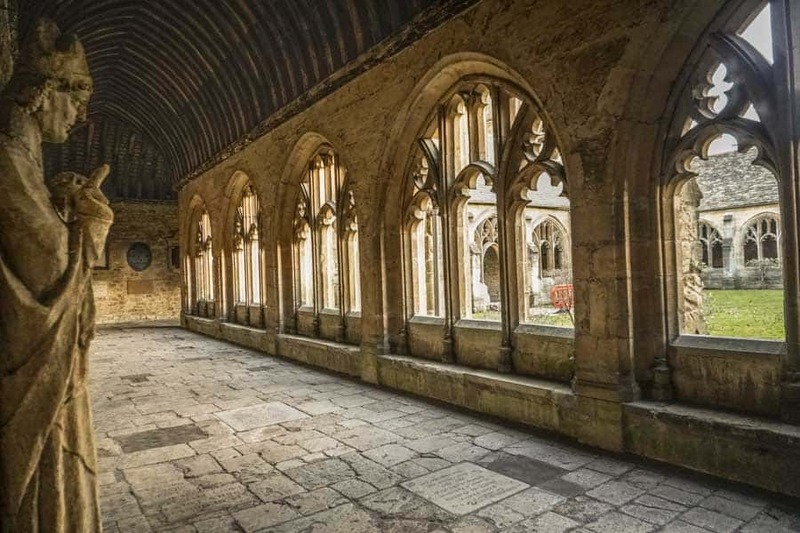 The New College Cloisters crop up in Harry Potter and the Goblet of Fire quite a few times – they were used for many of the corridor scenes within the film, including the one where Harry has to push through all the Gryffyndor students wearing Potter stinks badges to go and speak to Cedric. The New College Courtyard was also used as an Harry Potter Oxford location in Harry Potter and the Goblet of Fire. Mad Eye Moody has popped up on the scene and transfigures Malfoy into a ferret and stuffs him down his buddy’s trousers before he’s told off by Professor Mcgonagall. Fee for entering New College – £5 in the summer, free in winter. Fancy seeing a game of real-life quidditch? Well, check out the Oxford Universities Quidditch Club. Mudbloods Muggles dash around the pitch (sadly, they haven’t yet worked out how to fly but give them time) in a real-life version of the fantasy game. I’m so sad that this didn’t exist while I was up at Oxford – running around with a pretend broomstick and slamming balls through Quidditch hoops sounds is exactly the kind of thing I’d have spent my time doing. And there we are, our self-guided Harry Potter walk in Oxford. I hope you have even a smidge of the fun following the tour that I did researching and writing it. Wear comfortable shoes. Oxford’s cobbled streets might be beautiful but they can be killers on your feet. You don’t want to be the person hobbling around halfway through the day. The colleges have very specific hours when they are open to the public. I have included links to their websites but check before you go. As a rule, they’re more likely to be open in the afternoon, so I would start your Harry Potter walk around Oxford in the afternoon. 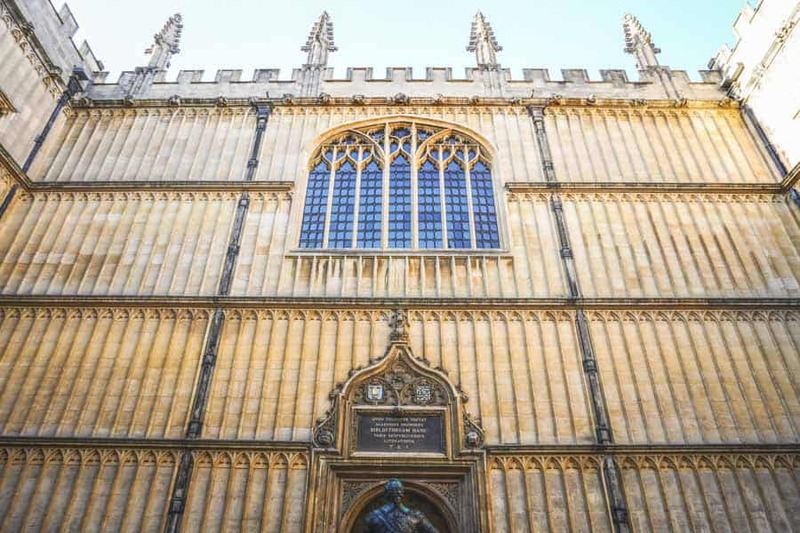 You do have to pay for entrance to the colleges and the Divinity School and Duke Humphrey’s Library can only be accessed on a Bodleian tour – factor that into your costs. Oxford is an easy day trip from London. If it’s your first time visiting the city, I would recommend staying at least one night as there’s so much to explore. 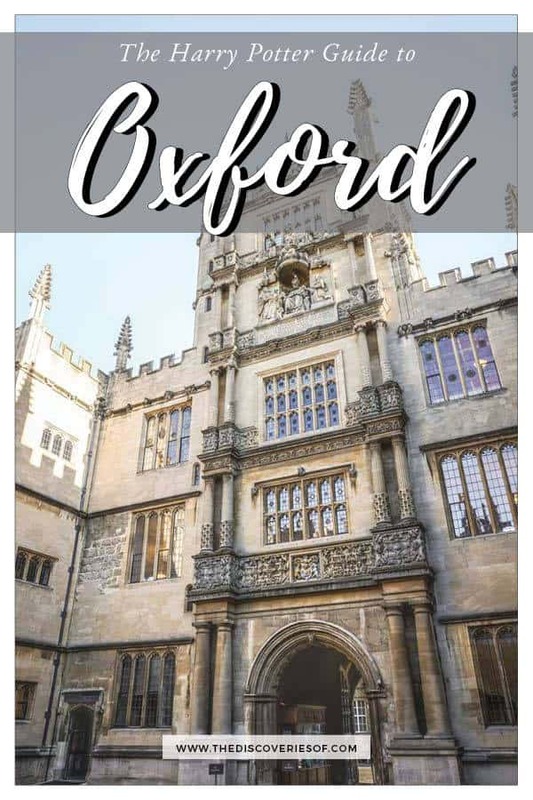 While there is plenty of accommodation dotted around Oxford, you can actually stay in many Oxford University colleges outside of term-time for a real Oxford experience (without all the boring hard work). Click here for a map of all the Harry Potter locations. Looking for more UK travel blogs and tips?